Golda Meir is fighting to “make a new world” in Palestine for her people, the Jewish people. This is a conflict we know well, that still rages today, so this is certainly a topical play that has a clear place in our modern-day political conversation. Adapted from William Gibson’s play ‘Golda’, ‘Momma Golda’ tells the story of Golda Meir, Israel’s first and only female Prime Minister, popularly referred to by many as “the grandmother of the Jewish people”.We follow her as she must make the decisions that begin and shape a new nation. It is a slow start, a blow by blow exposition of the political climate documented through phone calls and monologue. However as the human element of the story is found, the show warms towards something that is both humorous and moving. 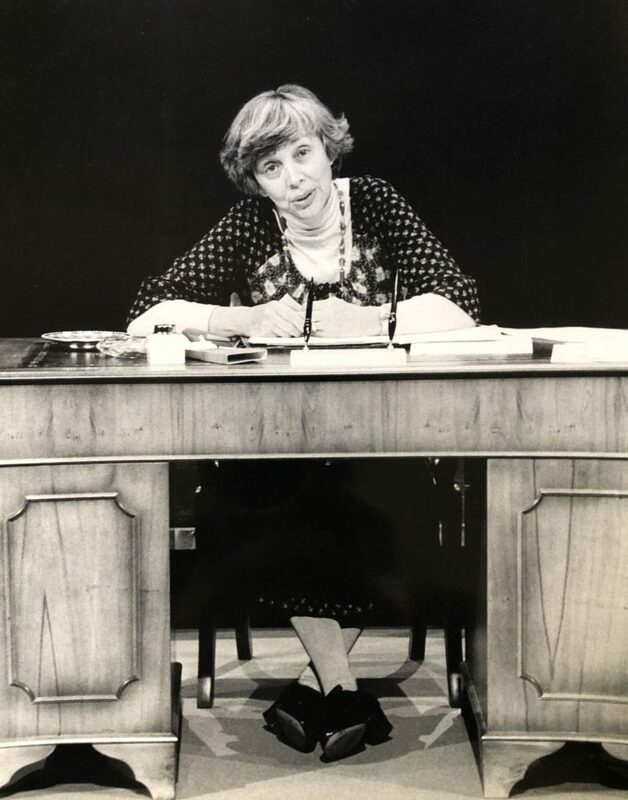 Playing Golda Meir, is the remarkable 93 year old Thelma Ruby, who co-wrote the show with her late husband Peter Frye, and toured it internationally with him between the years 1980 and 1988. She is a power house onstage, warm and witty, playful and poignant in her portrayal. Sean Baker plays opposite her, morphing between the different people in her life, her husband, generals, politicians and so on. It is certainly a challenge to take on and he struggles in the role. He doesn’t seem to be comfortable enough with the text to lend much naturalness or flow to his lines. However hopefully this is something he will settle into as the run progresses because the moments that are convincing work really well, and he lends a lovely vocal tone to his speeches. The set is simple, a desk, a table, each illuminated in turn (Clancy Flynn), as we move between spaces and years. This is a weak production in many ways, but Thelma Ruby is a pleasure to watch, and there is scope for this to be a topical and engaging revival.